"For those who understand no explanation is needed. Welcome to my CRPS awareness site. The purpose of this website is to help raise public awareness of a disease that is hard to explain and poorly understood. It is also intended to help others with CRPS, friends, carers and anyone involved in the well-being of those with CRPS to understand how serious this disease can be. My story offers an insight into the lived pain experience but I am not a medical professional, therefore my site contains limited information about CRPS/RSD; more information can be found by using my links page. Please take time to learn something about CRPS, I hope you can gain a basic understanding of this debilitating disease and the impact it can have on the individual life and their loved ones. Complex Regional Pain Syndrome (CRPS), previously known as RSD (Reflex Sympathetic Dystrophy) is a medical condition involving a malfunction of the peripheral and central nervous systems where long lasting intense pain is experienced, usually in a limb. The pain is often felt as burning, stabbing, shooting and throbbing or a combination. The onset of CRPS usually follows a trauma, injury or surgery; after the original injury has heeled the pain continues and becomes a disease in its own right. The pain signals go into overdrive and stay turned on even after the initial injury or trauma has healed. CRPS is not new and the condition was originally described during the American Civil War (1861-1865) where it was called causalgia. Remission is sometimes brought about but only if the condition is diagnosed and the appropriate treatments started within the first 3 months; the average time for diagnosis is 3 years. There is no known cure and treatment is complicated, involving drugs, physical therapy, psychological treatments and neuromodulation and is often unsatisfactory, especially if begun late. Amputation of the afflicted limb is not an option as it can make the condition worse. Spinal Cord Stimulation is a last resort means of some sufferers reducing their level of pain when all other treatments have failed to do so. 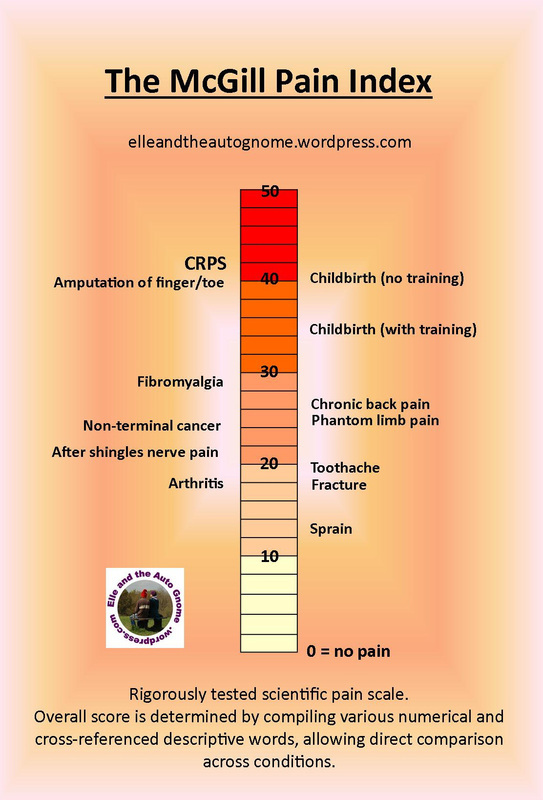 CRPS has the unfortunate honour of being described as one of, if not the most painful long term condition, scoring 42 out of a possible 50 on the McGill pain scale, above such events as amputation and childbirth. Lack of social awareness has inspired patients to campaign for more widespread knowledge of CRPS and lack of clinical awareness has led to the creation of support groups seeking to self-educate with the latest research. This website is written, designed, published and funded by Rosemary Eagle.